Australia. The rugged, untamed land known for its kangaroos, its wild and captivating landscapes and its Hemsworths. It’s become something of its own myth. From hilarious parodies like that episode of The Simpsonsto the 80s classic film Crocodile Dundee, pop culture has been responsible for starting a few myths about Australia that we’d love to clear up. But don’t worry. Whilst this list might burst a few bubbles for you, we think you’ll find our country even more wondrous than its myths would have you believe. … Okay, well, full disclosure, sometimes Greg and I actually do have kangaroos in our backyard. However, we live on a 27-acre farm! Even so, spotting a kangaroo in our paddocks is still rare enough that it’s super special when it happens. The truth is that unless you live in rural parts of Australia, you’re very unlikely to see one of these gorgeous fellows on any sort of regular basis. Many who live in metropolitan areas have to go to a zoo to see one up close. Most of Australia’s population live in heavily built-up areas and there is little to no room for wildlife to thrive. Also… nobody has ever in history jumped in a kangaroo’s pouch and ridden it somewhere. Kangaroos are marsupials. This means that only females develop a pouch which keeps her baby safe and nourished throughout its infancy. These pouches are tiny and from the outside just look like a tuft of fur. They are just big enough to house a baby joey. Male red kangaroos have been known to get as large as 2 m tall. This is huge, yes, but not huge enough that you could ride one. Not only that but as cute and cuddly as they look, kangaroos are wild animals. By law, you cannot keep one as a pet. A male kangaroo, if cornered, can deliver a powerful blow with its front paws or haunches (yeah… boxing kangaroos are real. There’s one that’s not made up). Oh sure, they may look kind of like a cute fluffy silver teddy, but koalas are not related to bears at all. 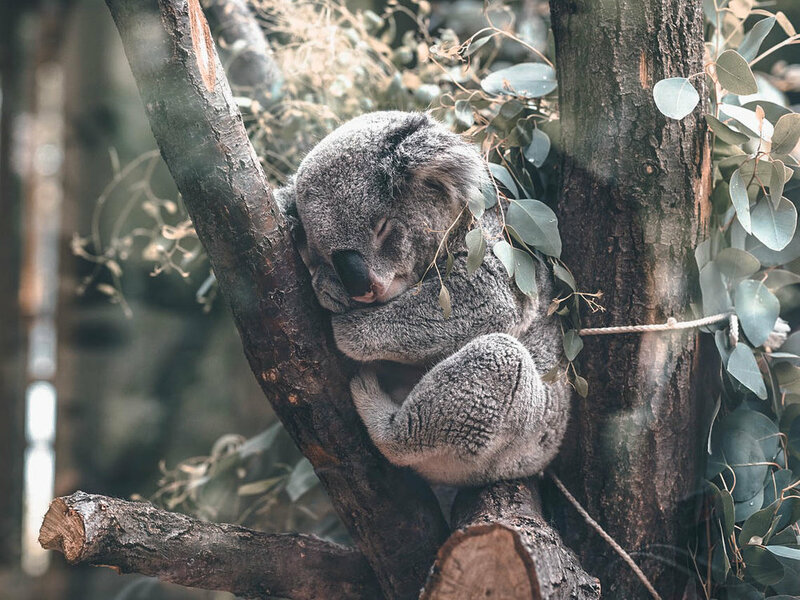 Like kangaroos, koalas are actually marsupials. Whilst I wouldn’t ever go near a wild one and try to pick him up (they are wild animals and do have sharp claws), never have I ever actually heard of one voluntarily dropping out of a tree to attack someone. I mean, look at this guy. In other words, drop bears are not an actual thing, though we Aussies apparently find it hilarious to warn tourists to the contrary. 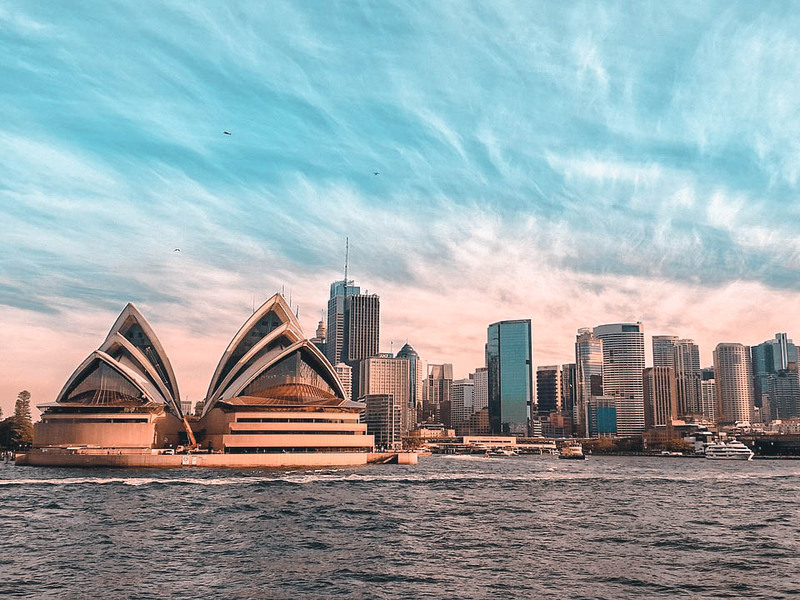 Thanks largely to its popularity with tourists and press from its hosting of the 2000 Olympics, Sydney has commonly been mistaken for Australia’s capital. When we visited the USA, we were surprised at how many Americans thought Sydney was our capital, and some even thought it was our only city. Whilst Sydney does house a lot of national events and is a very popular tourist destination, it is not the capital of Australia. The capital of Australia is, in fact, Canberra, which incidentally is my home city. Canberra is about three hours southwest of Sydney. Our national head of government is housed there at Parliament House. Australia’s wildlife is beautiful, unique and yes, it can sometimes be deadly. For that reason, even the cute and cuddly looking ones are better off left alone. If you are fortunate enough to spot Australian wildlife, admire it from a distance but stay out of its way. Most of our wildlife, even if dangerous, is more afraid of you than you are of it and will likely just try to put distance between you. There are some notable exceptions. 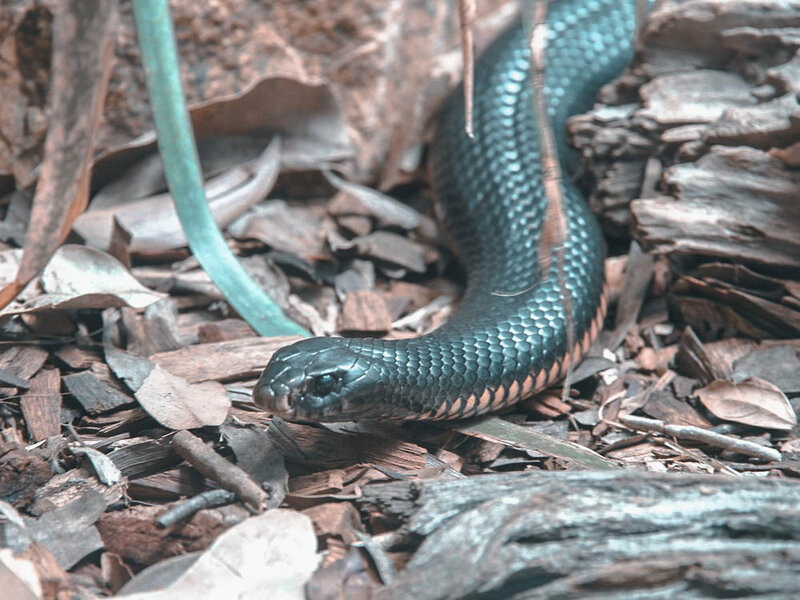 Tiger snakes and king brown snakes have been known to give chase when threatened. In the water, you do need to be on the lookout for jellyfish, crocodiles, and sharks. 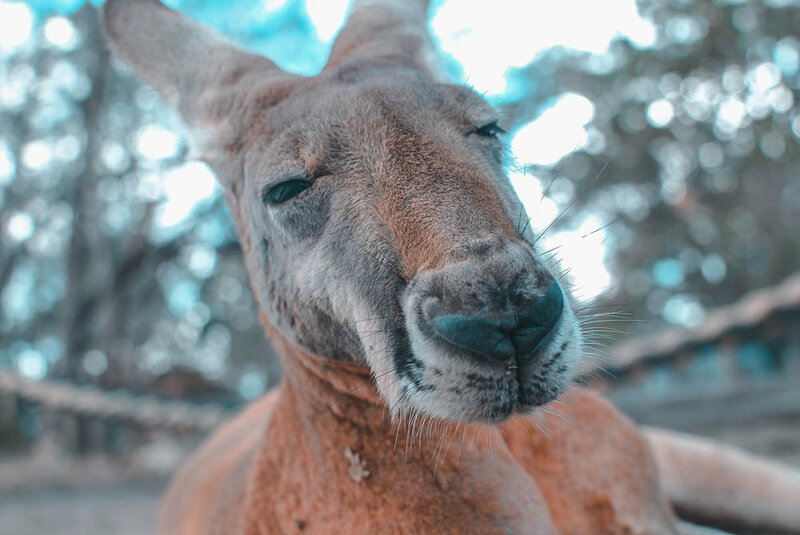 However, as long as you use your common sense, take precautions when out hiking, pay attention to signage and swim in patrolled beaches, you are just as unlikely to fall prey to the wildlife in Australia as anywhere else. In the 1980s, Crocodile Dundee star Paul Hogan’s tourism advertisement for Australia promised that if you came over, we’d slip another shrimp on the barbie for you. For starters, Australians don’t call them “shrimp”. In fact, I would wager that many Aussies don’t know what a shrimp even is. We call them “prawns” here. The word “shrimp” was used so that other countries would understand what we were talking about. Secondly, it is true that we do love a good barbie. We love them so much, in fact, it’s become a Great Australian Tradition to have them outside everyone’s favorite hardware store, Bunnings, on a Sunday morning. But prawns are rarely seen on the barbecue (and definitely not at said hardware store). We really only barbecue them if we’re trying to be fancy. We Aussies are instead partial to cooking steak, lamb chops or what we affectionately refer to as a “sausage sizzle”. If an Australian’s ever on the fence about attending something you want them to come to, you’ll likely win them over on the promise of a sausage sizzle. This consists simply of a barbecued sausage wrapped in a piece of plain bread with tomato sauce and perhaps some barbecued onion if we’re feeling fancy. So, we don’t really eat shrimp/prawns? Of course we do! Being that most of our capital cities hug our coastline, fresh seafood is a big part of a typical Australian diet, and prawns are no exception. In fact, at Christmastime, because it gets so hot here in Australia, we’re more likely to tuck into prawns and cold cuts than a hot roast turkey. Whilst we do barbecue the odd prawn, most of us like to pick up a precooked bag of them from our local fisho (a man in a food truck who sells them on the side of the road) and tuck in straight from the bag. I don’t, though. I can’t eat anything while it’s watching me. It is true that much of Australia enjoys glorious sunny weather at most times of the year. Here in southeast Queensland, our winters are relatively mild. As I type this post, in the middle of winter, we’ve been enjoying midday temperatures of up to 24 degrees. However, part of what makes the Australian landscape so breathtaking and diverse is the diversity of our climate itself. Up in north Queensland, we have a tropical climate. It is humid pretty well year round and rains a lot, producing gloriously lush rainforest. In summer, there are sometimes massive cyclones leading to epic flooding. We even have an alpine region, stretching from New South Wales to Victoria, where we get snow in winter. The skiing’s brilliant. Canberra, where I used to live, gets so cold in winter that it sometimes snows there. At the country’s most southern point in Tasmania, in summertime, the minimum temperature has been as low as 3.3 degrees Celsius (38 Fahrenheit). Don’t even ask what it’s like in winter. The size of Australia on the map is a bit of a conspiracy of cartographers which makes us appear like a small island at the bottom of the world. Okay, the bottom of the world part is kind of true, but not the size. Australia’s size on the map is actually only shown proportionately to its population. We have a relatively small population of 24 million people. However, our country is massive with an area of 7.692 million km2. Just to put that into perspective, Australia is roughly the same size as the whole of Europe and the United States. Yes, it’s true, the first British settlers brought shiploads of convicts to Australia from 1788. Many of them were released and became Australia’s first settlers. However, it has been estimated that only about 20% of Australians today actually have convict ancestry. For my part, I have Spanish, Polynesian, German and English ancestry, just to name a few. Both of my paternal great-grandfathers were English settlers who came over to Australia as free men well after the first settlement. Whilst you might think that ‘G’day’ is Aussie for ‘hello’, you’ll actually rarely hear an Aussie say this nowadays (Greg does). The truth is that it’s starting to fade from our diction, especially amongst younger urbanites. Research has shown that Australians are starting to abandon our notorious accents and slang in favor of more Standard English. We fairly seldom speak words like sheila, dunny and fair dinkum in modern Australian culture. 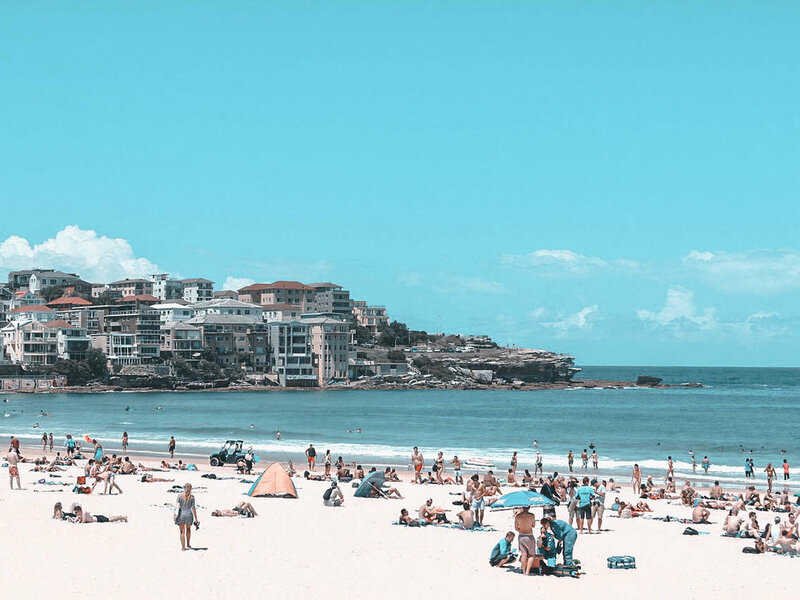 That said, there are quite a few Aussie colloquialisms still hanging around that might sound strange if you’re a tourist here, so let us break them down. We like to abbreviate words and names. For instance, barbecue becomes barbie, a U-turn is a u-ey, this afternoon is th-s’arvo, we call a sandwich a sanga and McDonald’s becomes Maccas. After we’ve removed a syllable or two, we like to add ‘O’ to these abbreviated words and names for some reason. For instance, your friend Dave becomes Dave-o, the service station is the serv-o, the liquor store (or bottle shop) is the bottle-o and the fishmonger on the side of the road selling prawns is the fish-o. Sometimes, a similar phrase can mean different things. For example, to have a yarn with someone is to talk to someone. To spin a yarn usually means you’re telling a tall tale. Okay, truth be told, we do have a few words we’ve completely made up, like Hoo-roo for goodbye (this is one of my personal favorites), Drongo (a person who is a no-hoper), and woop woop (in the middle of nowhere). Also, if an Aussie pokes fun at you or tries to pull the wool over your eyes, take it as a sign he probably really likes you. Making fun of people is a sign of an Aussie’s utmost affection. Many Australians have a very dry, irreverent sense of humor and we’ll even poke fun at ourselves. We like to call it “taking the piss”. Whilst Vegemite is a common household spread, it is pretty well as much polarising here as it is everywhere else. You either love Vegemite or you hate it. However, even those of us who love Vegemite do not slather it on everything. I would even wager that probably nobody has it at every meal or even every day. Whilst it has played several guest starring roles over the years in things like Vegemite cheese, Vegemite chips, and Vegemite cheesy scrolls, Vegemite has largely remained a breakfast food, served on toast first thing in the morning. Don’t expect anything remotely sweet: Vegemite has a very savory, even salty taste. In fact, my favorite way to enjoy Vegemite is as an accompaniment on a cheese and roast beef sandwich. Yum! However. If you want to lure an Australian somewhere, and for some reason the sausage sizzle didn’t work, 9 times out of 10 Vegemite isn’t going to cut it. I would take the liberty of suggesting that the true way to an Aussie’s heart is with Tim Tams. Tim Tams are a chocolate-dipped chocolate biscuit with chocolate icing in the middle. I feel like my description doesn’t do them the justice they deserve. They are so delicious it is a feat of impossibility to stop at one. If you know an Aussie who’s homesick, they’re probably just really missing Tim Tams. In fact, some of us have been known to take them with us overseas because we can’t live without them. So there you have it. 10 myths about Australia that are totally untrue! Even without being able to ride in mythical giant kangaroos or hot sunny weather all year round, we think Australia is a top spot to come and explore, each part with its own unique beauty, landscape, and wildlife to discover. 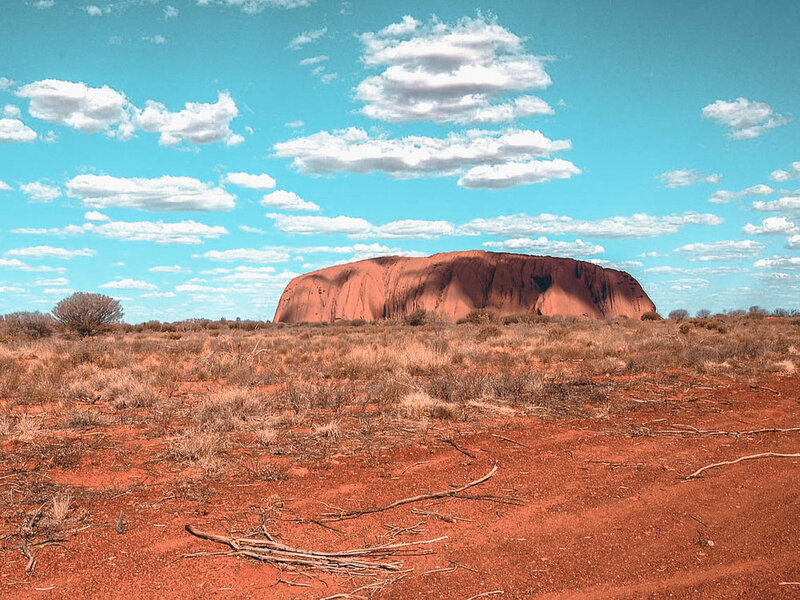 We hope this list inspires you to book your trip Down Under. Come on over and we’ll throw on a sausage sizzle.